Direct all of your guests to a single location that has all of the house details. Allows visitors to see when the house is going to be free. What is The Vacation Calendar? 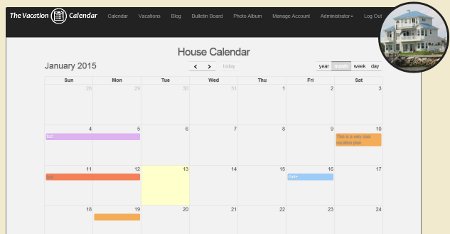 This is the main view of online calendar on TheVacationCalendar.com which allows everyone to see when the vacation home is in use. 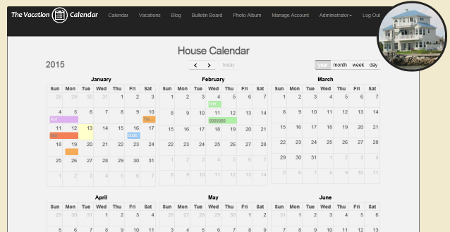 When a vacation is scheduled the user can set the online calendar to show that the house is occupied. Users can choose to use color to enhance the calendar or to signify special meaning, such as "would like to trade this vacation" for different time. The House Bulletin Board is the perfect solution to that all important piece paper that is always getting misplaced. This is a great place for contact information, house instructions, rules, cleaning services, favorite restaurants, directions, etc. So this is the money shot of TheVacationCalendar.com. Using this simple screen anyone who is authorized to schedule a vacation can do so. 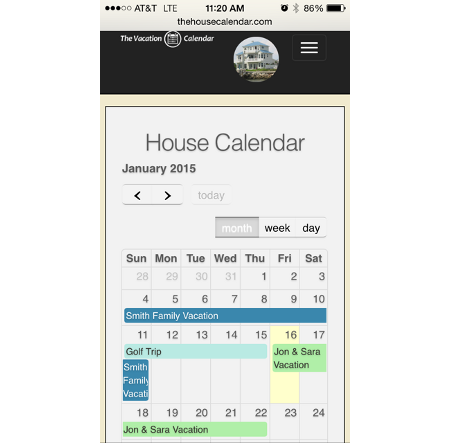 The site checks that there are no conflicts on the online calendar and prevents you from ever having multiple parties showing up at your vacation home at the same time. When TheVacationCalendar.com was first built, smart phones were barely beginning to gain steam. Now, the site is used on all sorts of devices from all the major vendors. TheVacationCalendar.com will adapt to whatever phone, tablet or computer you want to use! How have you ever lived without a vacation home blog?!?! 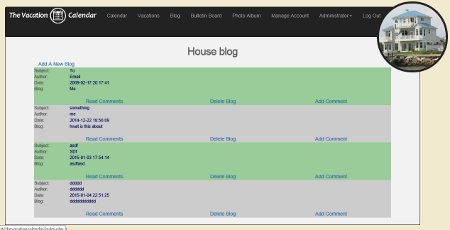 Since the House Bulletin Board is only updated by the administrator of the house, the House Blog gives everyone a place to share thoughts, provide updates, and generally make fun of each other. 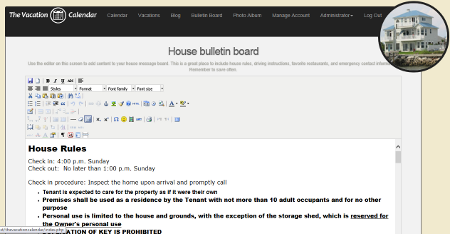 The House Bulletin Board is one of the most popular features of the online calendar and is easily maintained using the WYSIWYG (what you see is what you get) editor. This has all the same functions that you are accustomed to on your word processor so you can create a fun and appealing bulletin board without any coding. This is another favorite for many of the site's users. 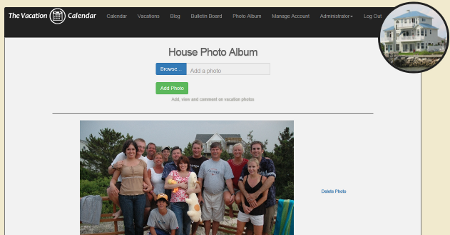 Since people were getting more and more use out of the vacation homes thanks to the online calendar system in TheVacationCalendar.com, we needed to provide a way to memorialize the great times you are having. So we added a new photo album. It is pretty simple for the first iteration, just add photos and allow anyone to comment. As always, the Administrator has the ability to remove any photos or comments that are inappropriate. This simple screen lets the Administrator of the house control the users. 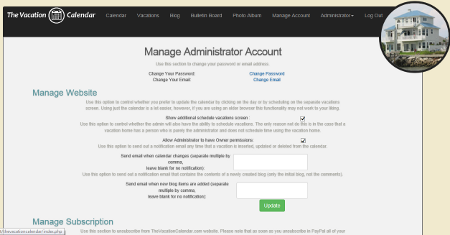 If you forget your password you can either use the automated password reset functionality or you can call the Administrator and he/she can update your account in a few clicks using this screen.